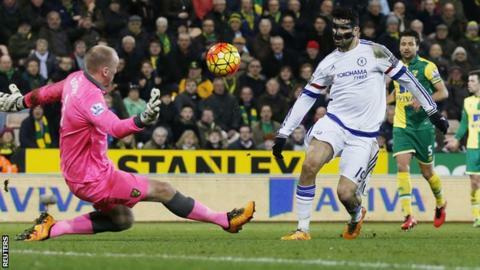 Norwich fell into the Premier League relegation zone as Chelsea continued their impressive form under Guus Hiddink with victory at Carrow Road. Blues full-back Kenedy drilled in from 20 yards after 39 seconds - the fastest goal of the Premier League season. Diego Costa doubled the lead on the stroke of half-time, running from an offside position to lift the ball home. Cameron Jerome hit the bar before Nathan Redmond scored as Norwich lost for the eighth time in nine games. The Canaries have taken just one point from a possible 24 - finding ugly form at the wrong time of the season. Though they rallied late on, with Redmond and substitute Gary O'Neil going close, Norwich need points, not performances, with just 10 games to go. The downward momentum Norwich have will worry both playing staff and board members, as missing out on an enhanced Premier League TV deal next season would be a tough financial pill to swallow. But the reality is Alex Neil's side are coming up short. They have scored in just four of their past eight league games and, for all their effort, seem light up front when it matters. Jerome hit the bar from six yards in the second period when he should have scored and his lack of killer instinct summed up a display which was admirable if uninspiring. Fellow relegation strugglers Sunderland and Newcastle visit Carrow Road in the run-in, but Norwich - 18th in the table on goal difference - must find their form soon. Before Chelsea's visit they had fewer touches in opponents' area than any other side in the league. So is a change in style needed? Or are Neil's side simply doomed? Redmond's strike - from a Wes Hoolahan pass - and performance will be one positive, and perhaps Norwich fans can draw some comfort from their early misfortune. Referee Lee Mason was a clear target of home fans' frustration in the opening period as a succession of 50-50 calls went the way of the champions. Thibaut Courtois seemed to pick up a clear backpass and Costa was a yard offside in running onto Bertrand Traore's pass in first-half injury time. It proved key and was tough on the Canaries, but they must look at their own shortcomings too as Kenedy's early rocket arrived after the full-back was given plenty of time to fashion his shot. Being undone inside a minute was exactly what Norwich did not need on a night when they were desperate to right a poor run of form. Another worry will be an injury sustained by Alexander Tettey, while Gary O'Neil suffered a head wound as he collided with Robbie Brady. "Gary has a nasty gash and needs a few stitches, Robbie's lost two teeth and Alex is getting an X-ray on his leg," Neil said afterwards. Focus on the relegation zone could overshadow the fact Chelsea - in eighth - are in the top half for the first time since the opening week of the season. Their remarkable slump under Jose Mourinho is long finished, with key players returning to form to fashion a run of 12 league games unbeaten. Hiddink is yet to lose a league game since returning to the club and deserves praise for starting Kenedy and Traore. Costa seems hungry again and has eight goals and four assists in his past 10 league games, while Cesc Fabregas looked in control in midfield throughout. Hiddink is concerned his side will lose focus in league games with one eye on Champions League commitments but they showed they have the talent to come through such tests when not at their best. A top six-finish looks possible. "Now with the ambition of Chelsea we must set a new target and see what we can do in the direction of Europe," Hiddink said afterwards. Norwich manager Alex Neil: "The first goal is a real disappointment for us. We have six behind the ball and the left back scores. The second is offside and you expect the officials to get that. The fact is we didn't really get exposed for the first goal but didn't deal with it and shut down quick enough." Chelsea manager Guus Hiddink: "We didn't want to go into the battle but they forced us. We were sloppy in the first half, starting well with a beautiful goal and I think we could have finished it in the first half. We were complacent in the last pass. They made our life difficult." Chelsea have won three successive Premier League games for the first time since April. Eden Hazard ended a run of 17 Premier League games without an assist by setting up Kenedy for Chelsea's opener. Nathan Redmond scored his first Premier League goal since October. Wes Hoolahan has recorded his best season for assists in a Premier League campaign with eight. Norwich travel to Swansea - who are three points above them - on Saturday, while Chelsea host Stoke four days before their Champions League last-16 second leg against Paris St-Germain. Match ends, Norwich City 1, Chelsea 2. Second Half ends, Norwich City 1, Chelsea 2. Attempt missed. Timm Klose (Norwich City) left footed shot from outside the box is high and wide to the left. Assisted by Dieumerci Mbokani with a headed pass. Corner, Norwich City. Conceded by Branislav Ivanovic. Attempt blocked. Nathan Redmond (Norwich City) left footed shot from the centre of the box is blocked. Assisted by Wes Hoolahan. Delay in match Jonny Howson (Norwich City) because of an injury. Attempt missed. Diego Costa (Chelsea) right footed shot from the centre of the box is close, but misses to the left. Assisted by Cesc Fàbregas. Attempt missed. Nathan Redmond (Norwich City) left footed shot from the right side of the box is close, but misses to the right. Offside, Chelsea. Cesc Fàbregas tries a through ball, but Diego Costa is caught offside. Attempt missed. Nemanja Matic (Chelsea) left footed shot from the centre of the box is just a bit too high. Assisted by Willian with a cross following a corner. Corner, Chelsea. Conceded by Jonny Howson. Corner, Chelsea. Conceded by Timm Klose. Offside, Chelsea. Cesc Fàbregas tries a through ball, but Eden Hazard is caught offside. Delay in match Gary O'Neil (Norwich City) because of an injury. Corner, Norwich City. Conceded by John Obi Mikel. Attempt blocked. Gary O'Neil (Norwich City) right footed shot from outside the box is blocked. Assisted by Wes Hoolahan. Timm Klose (Norwich City) is shown the yellow card for a bad foul. Attempt saved. Cameron Jerome (Norwich City) right footed shot from the centre of the box is saved in the bottom right corner. Assisted by Robbie Brady. Attempt missed. Robbie Brady (Norwich City) left footed shot from outside the box misses to the right. Cameron Jerome (Norwich City) wins a free kick in the defensive half. Offside, Norwich City. Wes Hoolahan tries a through ball, but Nathan Redmond is caught offside. Substitution, Chelsea. Baba Rahman replaces Kenedy. Goal! Norwich City 1, Chelsea 2. Nathan Redmond (Norwich City) right footed shot from the right side of the box to the high centre of the goal. Assisted by Wes Hoolahan with a through ball. Kenedy (Chelsea) wins a free kick in the defensive half. Delay in match Timm Klose (Norwich City) because of an injury. Attempt missed. Cameron Jerome (Norwich City) header from the centre of the box is too high. Assisted by Robbie Brady with a cross. How tough is a cold night at Stoke? Read more on Mythbusting: Is a cold night at Stoke tough for players?